Tiramisu (pronounced "tih-ruh-mee-SOO") was invented in the 1960's at the El Touga restaurant in Treviso, Italy. Literally translated, Tiramisu means "pick me up" or "carry me up", which probably refers to the jolt you get after eating espresso and alcohol laced ladyfingers. It is often called an 'Italian Trifle" because, like any trifle, it has layers. 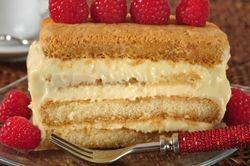 In this case, ladyfingers (finger-shaped cookies) are layered with a custard that has been mixed with mascarpone cheese. You can garnish the top of the Tiramisu with a dusting of cocoa powder and/or shaved chocolate, and a scattering of fresh raspberries (if they are in season). It is a good idea to make the Tiramisu the day before serving so all the flavors have time to soften and mingle and it has become firm enough to slice easily. If you want a firmer Tiramisu, place it in the freezer for an hour or two before serving. Ladyfingers form the base of this dessert, and these finger-shaped cookies that are about 4 inches long and 1 inch wide (10 x 2.5 cm), are made with a sponge cake batter. They are called Savoiardi in Italy and are so named because they come from Savoy Italy. For this dish I like to use commercially made ladyfingers (a real time saver) because they are thicker, their texture is crisp and very absorbent, and they keep their shape even after being dipped in the coffee soaking syrup. Cream Topping: Put 1 3/4 cups (420 ml) milk and 1/2 cup (100 grams) sugar in a medium sized saucepan. Place over medium heat, and bring this mixture just to boiling, stirring occasionally. Meanwhile, in a heatproof bowl, whisk together the remaining 1/4 cup (60 ml) milk, 1/4 cup (50 grams) sugar, flour, and egg yolks. When the milk comes to a boil, gradually whisk it into the egg yolk mixture. Transfer this mixture into a clean large saucepan and cook over medium heat, stirring constantly, until it comes to a boil. When it boils, continue to stir for another minute or two or until it thickens. Remove from heat and strain into a large bowl. (This will remove any lumps that may have formed.) Whisk in the Marsala (or rum), vanilla extract, and butter. Immediately cover the surface of the custard with plastic wrap to prevent a crust from forming. Refrigerate until thick and cold, at least two hours. Once the custard has cooled sufficiently, remove from the refrigerator. In a separate bowl, with a wooden spoon, beat the mascarpone cheese until it is soft and smooth. Gently fold, or whisk, the cold custard into the mascarpone until smooth. Coffee Soaking Syrup: In a large shallow bowl combine the coffee (espresso), sugar, and Marsala (rum). Taste and add more sugar if you like. To Assemble: Line a 9 x 5 x 3 inch (23 x 13 x 8 cm) loaf pan with plastic wrap. Make sure the plastic wrap extends over the sides of the loaf pan. Have ready the ladyfingers, coffee mixture, and cream filling. Working with one ladyfinger at a time, dip 7-8 ladyfingers in the coffee mixture and place them, side by side, in a single layer onto the bottom of the loaf pan. Spoon 1/3 of the cream filling over the ladyfingers, making sure they are completely covered. Repeat with another layer of ladyfingers by dipping another 7-8 ladyfingers in the coffee mixture and placing them on top of the cream. Again, cover the ladyfingers with cream and repeat with another layer of ladyfingers, cream, and ladyfingers. Cover the Tiramisu with plastic wrap and refrigerate at least 6 hours, preferably overnight. To Serve: Remove the plastic wrap from the top of the tiramisu. Gently invert the Tiramisu from the loaf pan onto your serving plate and remove the plastic wrap. Sift cocoa powder and/or grated chocolate over the top of the Tiramisu and decorate with fresh raspberries. Makes 8 - 10 servings. Preparation time 30 minutes. de Laurentis, Giada. 'Everyday Italian'. Clarkson Potter/Publishers. New York: 2005. Sax, Richard. 'Classic Home Desserts'. Houghton Mifflin Company. New York: 1994.